The Radisson Blu Hotel Cebu, which is located beside SM City Cebu Shopping Mall at the city’s north reclamation area, is now open. Carlson, a privately held, global hospitality and travel company, and SM Hotels and Conventions Corporation, a wholly owned subsidiary of Philippine conglomerate SM Investments Corporation, jointly announced that the first Radisson Blu hotel in Asia Pacific is open. The 400-room Radisson Blu Hotel Cebu is another milestone in Carlson’s plans to expand Radisson as a powerful, globally consistent, first-class brand. “Radisson hotels have a vibrant, contemporary and engaging brand essence characterized by the Yes I Can! service philosophy. Radisson Blu features flagship properties in prime locations, such as the Radisson Blu Hotel Cebu located in Cebu’s premier information technology hub,” said Jean-Marc Busato, managing director, Carlson Hotels, Asia Pacific. “The opening of the first Radisson Blu hotel in Asia Pacific is a major milestone. More hotels that are under development and in operation in the region will also become Radisson Blu hotels, as we deploy the brand globally,” added Busato. Located in the Philippines oldest and second largest city, Radisson Blu Hotel Cebu will be positioned as the city’s leading international upper-upscale hotel designed to appeal to both business and leisure travellers. “Our vision is to be a leader in the Philippines tourism and real estate sectors, and this hotel opening further strengthens our standing in the industry,” said Elizabeth T. Sy, president, SM Hotels and Conventions Corporation. “Radisson Blu is an established, iconic brand recognised for delivering market leading guest satisfaction. We are pleased to be able to leverage on Carlson’s hotel management and branding expertise to set similar benchmarks for the hospitality industry in the Philippines,” added Sy. 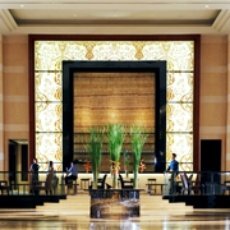 The interior design of the Radisson Blu Hotel Cebu will feature a strong use of local, natural elements such as woodwork carvings, weavings and pearls. All 400-rooms will be equipped with 37-inch flat screen televisions and iPod docking stations. Hotel guests will be provided with complimentary high-speed Internet access available throughout all public areas and guest rooms. The hotel will offer Business Class, a comprehensive new product and service offering that was developed around the concept of ‘travel empathy’. Business Class affords guests greater ease of travel with the full use of the Radisson Club Lounge with complimentary breakfast and evening cocktails, and use of a meeting room. It also includes added perks such as upgraded room and amenities, complimentary daily newspaper, turn-down service, express check-in and check-out services, a Nespresso coffee machine in the guestroom, and complimentary pressing of garments upon arrival. “Apart from being recognized as one of the top island destinations in Asia, Cebu is also fast becoming a business hub with convention facilities that meet international standards. Radisson Blu Hotel Cebu is positioned to deliver some of the highest levels of comfort and quality, making it an ideal hotel for business and leisure travellers,” said Grant Gaskin, general manager, Radisson Blu Hotel Cebu. The offers state-of-the-art meeting and event facilities. The Santa Maria Grand Ballroom, with top-performing audiovisual equipment, measures 1,200 square meters and has an 8 meter high ceiling. It will accommodate up to 1,200 persons and will be complemented by a highly versatile pre-function area spanning 400 square meters with direct access to a Very Important Person (VIP) holding room. The Niña Ballroom measures 780 square meters with a five meter high ceiling and can seat up to 650 persons. Additionally, there will be ten function rooms, named after Spanish galleons, with seating capacity ranging from ten to 80 persons. All of the meeting rooms will open up to a central meeting plaza for morning and afternoon service of refreshments. For dining, the hotel’s main restaurant FERIA will serve breakfast, lunch and dinner buffets featuring Asian, Japanese, Mediterranean, cold seafood, and dessert sections, set in a contemporary, interactive style food market. Guests seeking to dine by the 800-meter free-form swimming pool will be able to feast on an assortment of local and international cuisine, as well as freshly grilled seafood at THE POOL restaurant. The Radisson Blu Hotel Cebu is 11 kilometres from Mactan International Airport. It is also centrally located to Cebu’s financial and shopping districts, and is beside the SM City Cebu Mall, the largest shopping and entertainment complex in the region.